While the demand for yoga instructors is on the rise, there is also an increase in the number of people entering the profession. Lead the pack and improve your chances of landing an interview by crafting a well-written resume. This important document is the first impression you make on the hiring manager. Make it a good one by using our yoga resume templates. We provide a wide variety of resume designs from which to choose. Select the one that best represents your yoga philosophy. We also include resume writing tips and suggestions that outline best practices and guide you every step of the way. Breathe deeply and let’s begin. 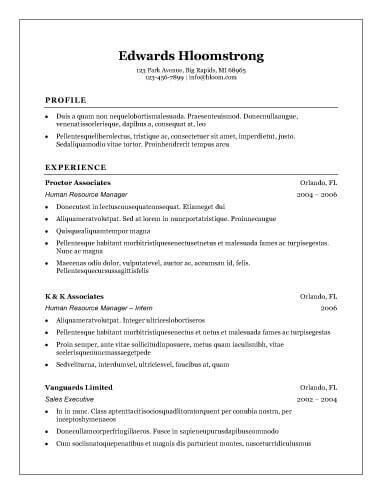 Why Use Yoga Resume Templates? Just as yoga demands discipline and attention to proper form, a good resume requires the same. It is tempting to quickly jot down a few previous jobs and call it a day, but that will not likely garner you an interview. Some hiring managers admit to scanning resumes for less than six seconds. Your document needs to make a powerful impact. Following our templates can guide you through these and other pitfalls. Another style that functions well with ATS, contemporary yoga resume templates utilize a bold design with columns, colors, and bulleted lists. It resembles a flyer or newsletter that advertises your skills. Don’t let the columns intimidate you. Follow our simple steps and those columns will stay in line. Check out these contemporary templates to find which two-column and three-column options work for you. /" target="_blank">professional, simple resumes that get the job with all the class and none of the fuss. Try adding just a spot of color to a header or a professional head shot for a little personality. You can’t go wrong with a traditional resume format. Most employers are familiar with this type of document and are comfortable reading it. It is perfectly suited for resumes written in chronological, functional, or combination style. It is also easy to email, an advantage when many jobs have electronic applications. With many styles to choose from, elegant to plain, you can easily customize these yoga resume templates to reflect your yoga practice. A creative resume is not for every occasion, but there are times when it’s an excellent choice. If you are applying to a yoga studio that has a hipster-trendy vibe or serves a colorful, artistic community, these yoga resume templates are a great option. 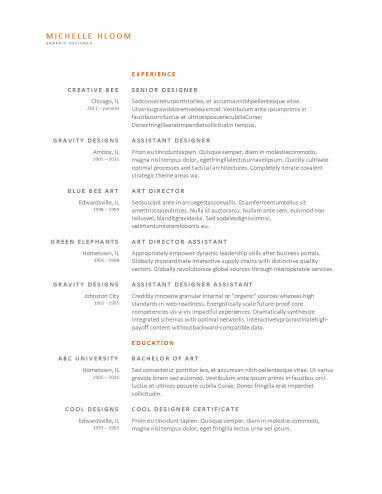 Creative resumes use more color and graphics than traditional formats. Some include a space for a professional photo, and the whimsical layouts can reflect your hobbies and interests. The modern resume strikes a balance between conservative and cutting-edge, using current fonts for a more polished look and a little color to illuminate important sections of the document. Modern resume templates work well with companies that use an applicant tracking system. This software skims resumes and removes the ones that don’t seem to fit the job description. With a crisp, clean format, modern resumes are easily machine-read. The summary statement quickly identifies your strengths and what you have to offer the company. An objective statement mentions your goals and what you hope to learn from this job opportunity. They are generally considered old-fashioned; however, recent graduates looking for their first job can use an objective statement to great effect. For either, keep the statement four to six lines long. Mention hard and soft skills. Show a bit of personality and that you fit with the company culture. Vary this section depending upon how much experience you have. If you are applying for an advanced yoga position, there’s no need to mention your college summer job as a camp counselor. However, if you are a newly minted college graduate, it is appropriate to put that job here. List in reverse chronological order your employment, going back no more than 15-20 years. Be sure to include the name and address of the businesses and the dates of employment. Write three to five brief bullet statements describing your responsibilities and achievements for each position. We even help with cover letters and interview questions to give you a head start on the job search process. Check out the resume builder and take the first step of your next journey.